LAUSANNE, Switzerland & NEWARK, Calif. — March 4, 2019 — The Ultimate Ears BOOM 3 portable Bluetooth speaker just got more personal, thanks to myBOOM studio. This new design experience allows you to create your very own custom BOOM 3 in just minutes. Showcase your unique style by selecting from thousands of possibilities of trendy fabrics, colors and patterns for different parts of the speaker such as the caps, hang loop, and volume buttons. You can even add your name or other fun text on the speaker to make it truly your own or include a note to make it the perfect gift — you design it, we build it. To get started, simply start designing your BOOM 3 in the myBOOM Studio on desktop or mobile. Take a trip on the wild side by choosing from new fabric designs like Jungle Bell, NY Kitty or Frozen Kingdom, or manifest your creativity with Marble Marvel, Blue Dreams and Berry Fun. With twelve fabrics and eight color options for the caps, spine, loop and volume buttons, your options are boundless. Additional colors and fabrics will become available over time. It’s your speaker, your canvas, and your style. All speakers designed using the myBOOM Studio have the same product features as BOOM 3, including its 360 degree sound and deep bass, portable size, Magic Button, compatibility with the POWER UP charging dock and IP67 rating for staying waterproof and dustproof. myBOOM 3 speakers also work with PartyUp, so they can be paired with up to 150 of any generation BOOM or MEGABOOM speaker for even fuller sound. Ultimate Ears myBOOM 3 portable Bluetooth speaker is available now in the U.S. and expected to be available globally in the summer. You can design your myBOOM 3 on the Ultimate Ears website or at select T-Mobile store locations in Chicago and Miami. myBOOM 3 retails for $179.99. For more information, please visit studio.ultimateears.com or connect with us on Instagram. Ultimate Ears is transforming the way people experience music together, wherever life takes them. Ultimate Ears first revolutionized the way artists interact with their concert audiences by reinventing the on-stage monitor, turning it into a custom-fitted earphone. Today, Ultimate Ears, a brand of Logitech International, continues to bring music to life with its award-winning family of wireless speakers. Founded in 1981, Logitech International is a Swiss public company listed on the SIX Swiss Exchange (LOGN) and on the Nasdaq Global Select Market (LOGI). Learn more at ultimateears.com or connect with us on Instagram. LAUSANNE, Switzerland & NEWARK, Calif. — Aug. 30, 2018 — Your favorite, award-winning Ultimate Ears speaker just got better with the next generation Ultimate Ears BOOM 3 and MEGABOOM 3. These portable, waterproof BluetoothⓇ speakers have been redesigned with stunning two-toned, high performance fabric, engineered for applications like motorcycle jackets and fire equipment. Also new to BOOM 3 and MEGABOOM 3 is a Magic Button on top of the speaker for convenient music control. Each speaker has carefully balanced audio and 360-degree sound that lets you hear every note just as the artist intended. MEGABOOM 3 also provides deeper bass and improved clarity over the original MEGABOOM. Whether at a desert festival or a pool party, you’ll stand out with an iridescent speaker that makes music even more portable, durable and immersive. The all-new Magic Button allows you to play, pause and skip tracks directly on the speakers without fumbling around for your phone in a bag or far away room. When paired with the redesigned BOOM & MEGABOOM by Ultimate Ears iOS mobile app, you will also have one-touch access to all of your favorite playlists on Apple Music, which offers an entire catalog of more than 45 million songs. Music fans can also use the Magic Button to access their playlists on Deezer Premium—which offers 53 million tracks—on Android and soon on iOS. Additional music services will be added. Other upgrades to BOOM 3 and MEGABOOM 3 include a new IP67 rating so the speakers are not only waterproof and drop proof, but also dustproof, making them ready for any adventure. Improved Bluetooth range up to 150 feet enhances portability and the speakers float, so you don’t have to worry about losing them at the bottom of a lake or river. For added convenience, BOOM 3 and MEGABOOM 3 are compatible with the Ultimate Ears POWER UP charging dock (sold separately) for a simple, wireless charge, plus you can charge the speakers upright thanks to the repositioned USB port. The BOOM & MEGABOOM app also offers all of the features you love from previous speakers like PartyUp—which works with all generations of BOOM and MEGABOOM and allows you to connect up to 150 speakers—as well as a custom equalizer (EQ), and remote on/off controls, all in a newly designed interface. BOOM 3 and MEGABOOM 3 will be available in four dual-toned colors: Night (Black), Sunset (Red), Lagoon (Blue), and Ultraviolet (Purple). Ultimate Ears BOOM 3 and Ultimate Ears MEGABOOM 3 are expected to be available in the U.S. and in select countries in Europe and Asia in September 2018. Suggested retail price for BOOM 3 is $149.99; MEGABOOM 3 is $199.99; and POWER UP is $39.99. Pricing varies by country. The free BOOM & MEGABOOM by Ultimate Ears mobile app is available for iPhone on App Store and for Android™ on Google Play. For more information, please visit www.ultimateears.com or connect with us on Instagram. LAUSANNE, Switzerland & NEWARK, Calif. — Feb. 14, 2018 — Make a statement with loud sound and bold style with Ultimate Ears WONDERBOOM Freestyle Collection, the latest lineup to join the Ultimate Ears family of portable, seriously waterproof, go-anywhere speakers. Announced today, this collection of pint-sized, portable BluetoothⓇ speakers, with surprisingly big sound, are decked out in five designs to match every vibe: Concrete, Avocado, Patches, Raspberry and Unicorn. Concrete: Your look is everyday neutral but never basic. Concrete is inspired by urban texture, paint splashes and shadows. Avocado: Your style is subtle and understated. With Avocado, you’re always ready to “guac” and roll. Patches: You wear your heart on your sleeve and plaster your personality through patches and pins. Patches is a punch of personality to denim. Raspberry: You’re never afraid to go bold. Raspberry is fresh, hot and juicy. Unicorn: Magic is your middle name. Unicorn is a delightful color melt of pastels. WONDERBOOM Freestyle Collection complements the existing line of award-winning WONDERBOOM speakers, boasting the same crisp 360-degree sound with balanced bass. Waterproof and worry-proof, WONDERBOOM is IPX7 rated (so it can be immersed in water up to one meter for up to 30 minutes), drop-proof from up to five feet, floats on its own and sports a hanging loop so it can be easily attached to any bag. With up to 10-hour battery life and 100-foot wireless Bluetooth range, WONDERBOOM is the perfect companion for the shower, beach, music festival or pool party. The Ultimate Ears button on the top of the speaker lets you play, pause, skip and double up two WONDERBOOM speakers for double the fun. WONDERBOOM received a 2017 GOOD DESIGN Award, presented to the most innovative industrial, product and graphic designs by The Chicago Athenaeum Museum of Architecture and Design, in cooperation with the European Centre for Architecture, Art, Design and Urban Studies. Ultimate Ears WONDERBOOM Freestyle Collection is available now for pre-order at ultimateears.com. The collection is expected to be available at select retail stores worldwide from February 2018 for a suggested retail price of $99.99. LAUSANNE, Switzerland & NEWARK, Calif. — Oct. 23, 2017 — Today, Ultimate Ears introduced Ultimate Ears BLAST and Ultimate Ears MEGABLAST with Amazon Alexa: portable, wireless, Wi-Fi and BluetoothⓇ speakers with immersive 360-degree sound and hands-free voice-control, for at home and on-the-go. When connected to Wi-Fi, music fans in the US, UK, Germany and Austria can use the power of their voice to ask Alexa to control music from Amazon Music, iHeartRadio and TuneIn, and we expect to add voice control for Pandora and Deezer in the future. With Bluetooth, you can enjoy music from any of your favorite music services. As Ultimate Ears’ loudest, most powerful and best sounding speaker to date, MEGABLAST is meticulously engineered from the ground up with custom drivers that produce a full and crisp sound. The result is a speaker with more powerful mid-range, deeper bass, vocals and instruments that are produced clearer than ever before in our highly portable, battery-powered speakers. With a maximum sound pressure level of 93 dBC, MEGABLAST is the loudest speaker from Ultimate Ears and is 40 percent louder than Ultimate Ears MEGABOOM. Today Ultimate Ears also announced Ultimate Ears POWER UP, a sleek charging dock that makes charging easier and more seamless for BLAST and MEGABLAST. With POWER UP, say goodbye to messy wires and keep the music playing while charging. You can now take your music and Alexa anywhere your BLAST and MEGABLAST can go, from party to pool to park. When connected to Wi-Fi or a mobile hotspot, just ask Alexa to play music, order pizza, control smart home devices or try any of the more than 25,000 skills available for Alexa. Music never stops: When connected to Wi-Fi, you can take calls on your phone while the music continues to play uninterrupted on the speakers. And with hands-free voice control, anyone can play DJ -- just ask Alexa to play a song, turn up the volume or cue your favorite playlist. BLAST and MEGABLAST also give you the ability to stream music from the cloud, and a bigger range to roam and dance with a range of 330 feet on Wi-Fi. Both speakers have a Bluetooth range of 150 feet. Seriously waterproof and long-lasting battery life: Both BLAST and MEGABLAST are IP67 rated, so they are dustproof, waterproof and can be immersed in up to three feet of water for up to 30 minutes. Keep the party going with a battery life of up to 12 hours for BLAST and up to 16 hours for MEGABLAST. Smarter over time: Featuring a new Ultimate Ears app, BLAST and MEGABLAST get smarter and better over time. Using the app, you can update the speakers for new experiences and features as they become available. Subtle yet stunning colors for every style: A twist on classic saturated primary hues, BLAST and MEGABLAST are available in six colors: Graphite (Black), Blizzard (White), Blue Steel, Merlot (Red), Mojito (Green) and Lemonade (Yellow). Color availability varies by country. Any​ ​purchase​ ​of​ ​BLAST​ ​and/or​ ​MEGABLAST​ ​​through​ ​January​ ​23,​ ​2018​ ​will come​ ​with​ ​a​ ​three-month​ ​subscription​ ​to​ ​Amazon​ ​Music​ ​Unlimited.​ ​Amazon​ ​Music​ ​Unlimited​, the full catalog on-demand streaming service, offers access to tens of millions of songs and thousands of hand-curated playlists and personalized stations, as well as natural language voice controls powered by Alexa. This​ ​promotion​ ​is​ ​only​ ​available​ ​to​ ​new​ ​subscribers​ ​of Amazon​ ​Music​ ​Unlimited. Pre-orders start today. Ultimate Ears BLAST, Ultimate Ears MEGABLAST and Ultimate Ears POWER UP are expected to be available in the United States, United Kingdom, Germany and Austria beginning late October for suggested retail prices of $229.99 for BLAST, $299.99 for MEGABLAST and $39.99 for POWER UP. Pricing varies by country. All speakers and charging dock sold separately. The free Ultimate Ears app is available for iPhone on App Store and for Android™ on Google Play. For more information, please visit www.ultimateears.com or connect with us on Instagram. LAUSANNE, Switzerland & NEWARK, Calif. — May 31, 2017 — Today, Ultimate Ears launched “Bring Music To Life,” a new global brand campaign that celebrates the transformative power of music. In collaboration with internationally renowned graffiti duo Bicicleta Sem Freio, the campaign brings together music and art to showcase the technology that Ultimate Ears fans love about their award-winning, wireless BluetoothⓇ speakers: 360-degree immersive sound, seriously waterproof and virtually indestructible. With a pinstripe suit-wearing octopus drummer, a rad sea monster and a boxing panther, Bicicleta Sem Freio brings each innovative feature to life in three original illustrations that are as irreverent, bold and creative as the Ultimate Ears brand. The Second Street Collection from Ultimate Ears is expected to be available in select countries globally beginning in June 2017 for suggested retail prices of $199.99 for BOOM 2 and $299.99 for MEGABOOM. Pattern and color availability will vary by country. For more information, please visitwww.ultimateears.comor connect with us on Instagram. Ultimate Ears, the Ultimate Ears logo, and other marks are registered in Switzerland and other countries. All other trademarks are the property of their respective owners. For more information about Ultimate Ears and its products, visit the company’s website atwww.ultimateears.com. LAUSANNE, Switzerland & NEWARK, Calif. — March 29, 2017 — Meet the latest addition to the Ultimate Ears family of portable, seriously waterproof, go-anywhere speakers: the new Ultimate Ears WONDERBOOMTM, a pint-sized BluetoothⓇ speaker with huge personality and surprisingly big sound. The super-portable WONDERBOOM delivers uncompromising sound quality with clear, crisp, non-stop sound, as well as big, beautiful bass. WONDERBOOM is available in six fresh colors: Stone (Grey), Phantom (Black), Fireball (Red), SubZero (Blue), Cashmere (Pink) and Lilac. Like its award-winning siblings Ultimate Ears BOOM 2 and Ultimate Ears MEGABOOM, WONDERBOOM blasts crisp and clear 360-degree sound with immersive, balanced bass and is drop-proof from up to five feet. WONDERBOOM boasts a 10-hour battery life and 100-foot wireless Bluetooth range. Seriously waterproof and worry-proof, WONDERBOOM is IPX7 rated (so it can be immersed in water up to one meter for up to 30 minutes), floats on its own, and sports a hanging loop on top so it can be easily attached to any bag. Gear on with WONDERBOOM on a bicycle, hook it to a backpack, or cannonball into a cove without thinking twice. Never miss a beat with the new WONDERBOOM. Live for fun, not fussy features. 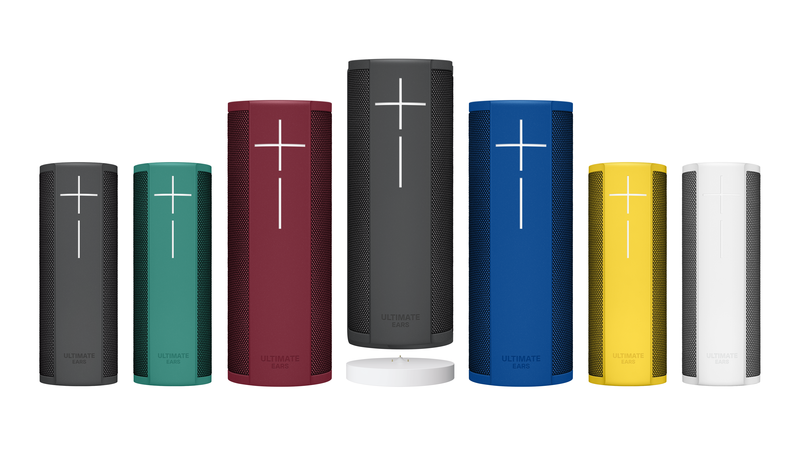 NEWARK, Calif. — May 21, 2013 — Today Ultimate Ears introduced UE BOOM, a social music player made to help you rage, riot, party and play the music you love, out loud. It’s designed to make the most of digital music’s convenience, while making it less of a solitary experience. UE BOOM is the first-ever social music player, a wireless speaker that’s packed with a specific set of features that sets a new standard for listening to music. It offers 360-degree sound and features a 15-hour rechargeable battery. Its versatile go-anywhere shape is wrapped in a specially developed acoustic skin that is both water and stain resistant so you can enjoy your music anywhere you go. And it is made for connecting with others. If more friends crash the party, you can wirelessly connect two UE BOOMs together through the free UE BOOM app (available for iOS™ and Android™) to play them in either stereo-to-stereo mode or traditional left/right stereo mode. In conjunction with the launch of UE BOOM, Ultimate Ears is initiating The Social Music Experiment – a lighthearted examination of the effect music has on people in social environments. As part of this effort throughout the summer, Ultimate Ears is teaming up with YouTube comedy channel JASH and its noted music expert, Reggie Watts, to produce an original series entitled The Social Music Experiment. Reggie will play the role of Ultimate Ears’ first ever “Head of Socio-Musicology” putting his social music theories to the test in a series of hilarious real-world experiments. In each episode Reggie will take a UE BOOM and his crazy hypothesis to the streets to understand the effects that social music has on everyday people in everyday places. The series launches today exclusively on JASH’s comedy network on YouTube (http://jash.com/social-music-experiment/) and will then be syndicated beginning May 28 across a variety of other digital sites including Collegehumor.com and ultimateears.com. Episodes are expected to roll out through the end of June. After nearly 20 years of working with the most discerning ears in music, Ultimate Ears has set out to help change the way people experience the music they love with its range of critically acclaimed wireless speakers and earphones. That tradition continues with UE BOOM and interactive programs such as The Social Music Experiment. UE BOOM is expected to be available in the U.S. and Europe in May 2013, and in select countries in Asia in June 2013, for a suggested retail price of $199.99. For more information, and to find a retailer near you, please visit www.ultimateears.com. "The Best Budget Bluetooth Speaker"
"The Best Bluetooth Speaker Now Works With Alexa and It's Amazing"
"Bass isn't just thumpier, it's crisper and imbues the music with drama and weight." "BLAST may be the first great portable Alexa speaker"
"BLAST Might Be the First Portable Speaker With Alexa Worth Caring About"
"the fact that they're battery-powered and water-resistant set them apart from AC-powered, indoor-only competitors"
"Ultimate Ears has a new waterproof Bluetooth speaker that's shorter and squatter than its popular UE Boom 2 speaker. For a sub-$100 Bluetooth speaker, the UE Wonderboom is near the top of the class for sound quality." "It’s tougher than it looks: UE’s latest speaker can survive being dropped or drenched, so you can rock out poolside (or as one tester learned, leave it outside in a thunderstorm) without fear of shorting the circuitry. Plus, it weighs less than a pound." "These cute speakers are capable of filling an average-sized room with sound, and they can work up to 100 feet away from a Bluetooth source. They come in customizable colors and deliver great sound, considering their size." "As you can see in the picture, this blushing pink speaker (or millennial pink, whatever you want to call it) floats. It also has about a 10-hour battery life, and if you and your friends have a few of them, they can all sync up to maximize the sound." "This is probably the coolest bluetooth speaker I’ve ever owned. It provides clear, crisp music with 10 hours of battery life. It comes in cool, stylish colors. Best of all: It is COMPLETELY waterproof. I tossed the speaker straight into a swimming pool, and my music continued to blast loud and clear. Yes, it’s pretty damn awesome. Never ceases to amaze my friends and family." "A nautical-looking rope handle lets you grab and take this pretty-in-pink speaker anywhere." "If you're looking to get good sound in the outdoors, you could do a lot worse than the $100 Ultimate Ears Wonderboom." "If I had to choose one of these speakers to recommend as the most well-rounded option, my pick would be the UE WONDERBOOM. It comes close to the Libratone One Click in audio quality and battery life, but it’s smaller and easier to carry, waterproof (and capable of floating) and at $99.99 it’s half the price." "If your dad likes listening to music on his iPod or his smartphone, get him a nice bluetooth speaker. Of course, you might have to show him how to set this up, but he will be able to enjoy his music throughout the house or even on the go." "Every outdoor adventure should be accompanied by summer tunes and the UE Roll 2 is a great option. It’s portable, waterproof and most importantly, can boom your tunes of choice at the beach, pool or patio." "Many Bluetooth speakers can only connect to a single device. The MEGABOOM, priced at $250, can handle two at a time, meaning you're not limited to a single music library when at the beach." "This pill-shaped 360-degree speaker is the most stylish of the bunch and comes in a broad selection of colors." “Don’t be fooled by the small size of this coconut-sized Bluetooth speaker...If you know Ultimate Ears, you know you’re getting incredible sound quality." "This tiny speaker punches well above its size, providing rich bass for a speaker so small."